Representative 49.3% APR. Representative example: £2,000 borrowed for 12 months. Total amount repayable is £2,772.97 in 11 monthly instalments of £231.08 and one final payment of £231.09. Interest charged is £772.97, interest rate 38.6% pa (variable), min 3.1% APR, max 1326% APR, min and max term: 3 – 60 months. Consider a Payday loan alternative. Millions of people use Payday loans and while they are handy to help when you need cash in the middle of the month they also have their drawbacks. Having a large chunk of money taken from your salary in one go can put you right back into the same position you were in when you needed the loan. You then need to take another Payday loan a few weeks later. This can turn into a difficult cycle to get out of. At Money trumpet we can help find an alternative which will allow you to pay the loan back over a few months, making things easier for you. For example, you can borrow as little £100 over 3 months or as much as £5000 for those bigger emergencies. 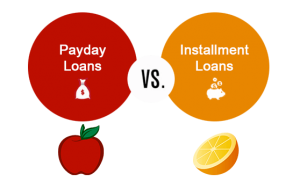 Payday Loans and Instalment Loans – What’s different? As mentioned above with a Payday or wage loans as they are sometimes called is that you will pay back the full amount on your payday plus the interest. An instalment loan however is paid back over a period of time by a series of scheduled payments. This means you can comfortably repay the loan and still meet your other commitments. What do I need to know about Payday loans and instalment loans in the UK. You can borrow from as little as £100 all the way up to £5000, the more you borrow the longer the loan term will be. Generally, the APR is a lot higher with a payday loan as its paid back all in one go on your salary date, so you only borrow the money for a 2-3 weeks. An instalment loan is a smaller monthly payment but as the length of time is longer the overall cost is higher. What’s the application process for an instalment loan? Our process is very simple and can be completed in a matter of minutes. Complete the quick form and Monevo will search in real-time across their network of instalment lenders to find a suitable loan. After the lender has carried out their relevant checks and you will have a final decision. Does it matter whether I get paid weekly or monthly? No not at all because this is not a traditional payday loan you will not be paying back the money all in one go on your pay date. As mentioned above the payments will be monthly. Do you charge fees for instalment loans? No never, our service is free. We do receive a fee or commission should you be approved for a loan. This doesn’t affect your deal. Are the payday lenders you work with reputable? Absolutely all lenders that offer payday and instalment loans are authorised by the FAC. Will I definitely be approved for an Instalment loan? As all the lenders on the panel have to comply with the FCA none of them can guarantee a loan and all the normal checks are still carried out. If your financial status in good stead and you earn a regular income you stand a good chance. You should be able to say yes to the below to make sure you’re eligible. Agree to undergo a credit check. Does it matter what I spend the money on? Not at all, your free to use the loan for whatever you need to. The lenders are more concerned that you’re able to comfortably replay a loan rather what you want the money for. Can you provide Payday Loan Alternatives to non-UK residents? Unfortunately no, we only currently provide our service to UK residents, although that may change in the future. Why should I choose Money Trumpet? We believe in providing the best service possible to our customers and most importantly for you is being able to use a hassle free, fast service that helps you find a great instalment loan. We only work with reputable lenders that provide an honest and competitive service.